HP’s new Chromebook 13 offers some of the latest technologies that the company is also putting in its top-line Windows PCs. The new laptop is just 12.9 millimeters thick with an all-aluminum chassis. 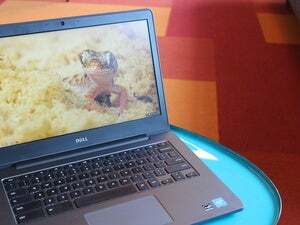 It has a 13.3-inch display that shows images at a 3200x1800 resolution. That is the highest-resolution screen ever in Chromebooks, an improvement from the 2560x1700 pixel display on Google’s Chromebook Pixel. The Chromebook 13 weighs 2.86 pounds and is the first with Intel’s 6th-generation (Skylake) Core M processor, which focuses more on battery life than performance. HP claims the Chromebook 13 delivers 11.5 hours of battery life. The laptop has 802.11ac dual-band wireless, 16GB of memory, 32GB of storage, a webcam, an SD card reader and integrated Intel HD 515 graphics. Like Google's higher-end Chromebook Pixel, the Chromebook 13 also has two USB-C ports for charging and connecting peripherals. The Chromebook 13 has another unique feature: the Elite USB-C dock, which will provide expanded connectivity to ethernet, external displays and other peripherals. The Chromebook 13 will ship this month with a starting price of $499. It is expensive compared to entry-level Chromebooks from Acer, Lenovo and Asus priced under $250, but you're paying for the luxurious features. Chromebooks are popular, low-cost computers for those who do most of their computing on the web. Google is positioning Chromebooks as an alternative to Windows PCs. With Chromebook 13, HP has answered Google’s call to upgrade the ecosystem with more sophisticated and powerful machines. Others are catching up. Acer last week introduced the Chromebook 14 for Work, which is the first with Intel’s faster Skylake-based Core i series processors. There are still questions, though, on whether the high-end features are needed in Chromebooks, which are devices in which the wireless network speed matters more than the processor performance. Most buyers opt for low-end Chromebooks that have entry-level Celeron or Pentium processors, up to 4GB of RAM, and minimal storage.